A bucket and a hot water cupboard… this sounds like my kind of recipe! I don’t think it can get more simple. Please, if you make this, please please come back and tell me how it goes. This feijoa wine recipe comes from Lynda Hallinan, who appears on Television New Zealand’s Good Morning show. She’s also the editor of NZ Gardener. If you’re into gardening… she has a wonderful gardening blog called Lynda Hallinan.com. Scoop the flesh out of 5kg feijoas (discard skins) and freeze overnight. Thaw, squash and steep in a bucket with 6 litres boiling water and 2 campden tablets. Cover with a tea towel and stand for three days, stirring occasionally. Strain to remove the gritty, gooey flesh. Pour liquid into a fermenting vessel fitted with an airlock and add an 8g sachet of wine yeast, 2 teaspoons yeast nutrients, 4kg sugar and 2 litres cold water. Leave somewhere warm, such as your hot water cupboard, till it stops bubbling – which could take a month or several – then bottle. If you’re interested in making your own feijoa wine and it all sounds a little bit daunting, then you really have to visit this series of blog posts by the wonderfully talented Tori Veysey who has a gorgeous blog, voyages of the creative variety. Now including her recipe (I would repeat it here but she has created an illustrated recipe – and you just need to go over there and download a version for yourself.) Tori has also photographed each step of the process as she makes her feijoa wine and has niftily taken the mystery out of some of the equipment and how to use it all. She really makes it all look so easy. 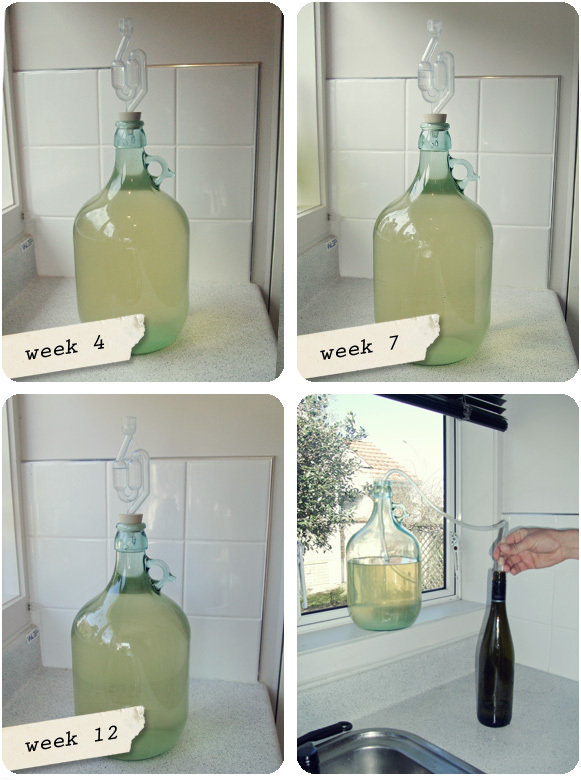 I love the labelling of the photos which offer a big reminder that it’s a four month process and a lot of patience is obviously required as the wine settles and clears. I’ve been assured that a taste test is coming soon… wish I was popping around to lend my taste buds to the challenge but I’ll just have to settle for reading about how it all turned out. And I really want to see the labels Tori is going to make for the bottled wine – you can see more of her whimsical and romantic graphic design work if you explore her lovely blog. I have a couple of entries on feijoa wine to post, but I’ll start with this one, which is from an article How to make feijoa wine by Peter Jeffries, appearing on the Yellow Pages ‘How to’ website.